Happy Monday everyone! Hope you all had a good weekend! It sure went by fast!! 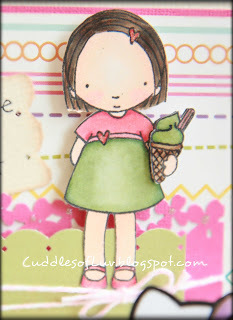 Today is Lollipop Crafts new challenge ... ANYTHING GOES!! an easy one where you can be as creative as you want! I used a step card base and added a panel on the last step. The back has a little pocket where I put a larger tag with a birthday message. Snoopy, Woodstock, and Hello Kitty are from coloring pages found on the internet (sorry but forgot to mark the link). She's turning 7, so I added it to the cake Snoopy's holding. Her name is computer generated and cut into little blocks. I have been wanting to put multiple images in to one project and you convinced me to do it! This is soo cute and I bet she loved it! 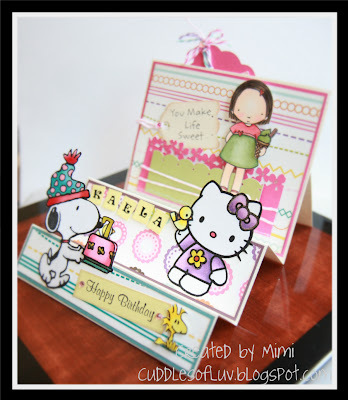 Wonderful job Mimi! Hope you are having a lovely Monday! Very sweet and fun card! So creative and love the use of the different characters!